Cabinet Genies hereby warrants to the original purchaser, for residential applications only, that all cabinets and accessories, hinges and all drawers, including system hardware, are free from defects in materials and workmanship. This warranty runs for as long as you own your home and begins upon the date of delivery to you. This warranty is expressly limited to repair or replacement of the defective part at the discretion of Cabinet Genies, and does not include labor for removal or replacement. This warranty does not extend to defects caused by improper handling, storage, installation, assembly or disassembly, intentional damage, product modifications, exposure to the elements including humidity which may result in warping or splitting, accidental misuse, abuse or negligence. Natural woods may vary in texture, color and wood grain, and exhibit subtle changes as they age. For example, wood joints may eventually have visible cracking around the joint area and cabinet colors may darken or lighten over time. Sunlight, smoke, moisture, household cleaners and other environmental conditions may cause materials to vary from their original color and/or to warp, split or crack. These variations are considered to be the nature of the material in relation to their environmental exposure and are not covered under this warranty. Warranty is null and void to all orders shipped outside the lower 48 United States. 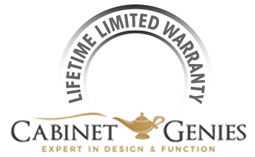 Cabinet Genies makes no other warranties other than those set forth herein and all other warranties are hereby disclaimed. The implied warranties of merchantability and fitness for a particular purpose are limited in duration to the length of the limited warranty period. The limited warranties set forth herein are limited to the first and original buyer and are not transferrable thereafter. In no event shall Cabinet Genies be liable for incidental or consequential damages to the purchaser or to any third party, including, without limitation, damages arising from personal injury, lost profits, loss of business opportunity, loss of property, economic losses, or statutory or exemplary damages, whether from negligence, warranty, strict liability or otherwise. Some states do not allow the exclusion or limitation of incidental or consequential damages, or limitations on how long an implied warranty lasts, so the above limitations and exclusions may not apply to you. This warranty gives you specific legal rights, and you may also have other rights which vary from state to state. All claims for defective cabinets and accessories must be submitted to Cabinet Genies in writing and must specify the defects present in the cabinets and accessories. After Cabinet Genies has had an opportunity to inspect the cabinets and accessories, they will, at their discretion, either replace defective cabinets and accessories or repair any defects in the cabinets and accessories.